Order pizza fast and easy and pay online with our new mobile app! 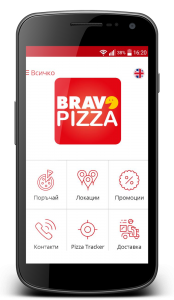 Find Bravo Pizza in Google Play and Apple Store. Every monday -20% off any 28cm, 40cm and 60cm pizza! Order MAXI pizza for the whole family and get free delivery!